Although I have purchased dozens of learning-Spanish programs, this is one of my first learning Italian programs. And the reason why I chose this program is because it is made by the same author that made Learn Beginner Spanish bundle. And I found that Spanish program to be very effective at helping me learn how to speak real, down-to-earth conversational Spanish. By the way, I also recently purchased the learning Portuguese program by the same author. First, I will talk about what I liked most about this program. One thing that really pleases me is that there is so much content for what I paid. The program has 30 audio lessons and nearly 13 hours of recorded audio. The teaching method is another thing that I really liked. The method is so engaging and interactive. The lessons are about 30 minutes long and I don’t think there was ever a moment when I was bored while listening to any of these lessons. These lessons only feature native Italian speakers – which really helped to improve my pronunciation in Italian. And it definitely gave me the confidence to speak Italian and hold a conversation with an Italian speaker. Hopefully, I’ll have the chance to travel to Italy soon and give my Italian-speaking skills a real test drive. I believe I gave this author’s learning Spanish program 5 stars. But I am only giving the Italian program 4 stars overall. And that’s because my reason for wanting to learn Italian is completely different from my reason for wanting to learn Spanish. I live in a city with a lot of Spanish speakers. And I have several Spanish speaking friends. So my reason for wanting to learn Spanish is for developing friendships and relationships with Spanish speakers. And the author’s Spanish program does an excellent job at that. But my reason for wanting to learn Italian is only for tourism or travel. So I am most interested in learning very basic Italian vocabulary for dining, staying at a hotel, what to say at an airport, etc. And a lot of the vocabulary in this Italian program seems to be for people who have a long term goal of achieving fluency in Italian or developing friendships and relationships with Italian speakers or for someone who has plans to relocate and actually live in Italy - which is not why I would like to learn Italian. I still think it’s a great program. 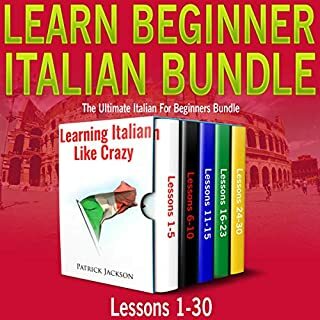 Not only will it really help to improve your pronunciation, it does a great job at helping the student understand Italian grammar without the lessons sounding overly academic. But it doesn’t address my personal needs for learning Italian. I’d prefer a crash course in “Italian For Travelers” as opposed to a program that guides me towards achieving fluency in Italian. So what do I like about this program? Normally, I review books, software and audio programs for learning Spanish. 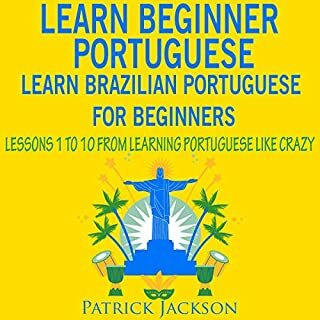 After learning that the creator of one my top-rated learning Spanish programs recently released a learning Portuguese program, I decided “why not” get a copy of this program as well. I also bought a copy of the learning-Italian program by the same author. Well, I like the fact that it only teaches Brazilian Portuguese. Not only are the voice actors in this audio program natives of Brazil, the narrator or the instructor in the program is apparently a native of Brazil – this really helped to improve my pronunciation and my Brazilian Portuguese accent. And I prefer to learn with a program that teaches Brazilian Portuguese – which is what this program teaches – as opposed to a program that teaches European Portuguese. I am sure that Lisbon, Portugal would be wonderful place to visit. I’m just more likely to take a trip to Rio De Janeiro, Brazil to see the carnival than take a trip to Portugal. I also think in most cities in the U.S. you’re more likely to meet someone from Brazil than you are to meet someone from Portugal. Which means the Portuguese, including the vocabulary words, taught in this program is more likely to come in handy. Another thing that really impresses me about this program is the teaching method. It’s the same teaching method used in the author’s other programs and I’ve found that method to be one of the most engaging and interactive ways to learn a foreign language. Not only does this method help you to develop an authentic accent, but it also helps you to naturally think in the foreign language. The way that a lot of programs teach a language would involve translating in your head the Portuguese you hear into English. In then in your head, you translate your response into Portuguese – just before you say your response. But not with the method used in the program. With this method you actually learn to think in Portuguese. With all the good things I said about this program, you’re probably wondering why did I decide to give it 4 stars instead of 5. Well, there are only ten lessons. Actually eleven lessons if you include the one bonus lesson. In order to give me the confidence I need to speak Brazilian Portuguese, I need about thirty audio lessons. If this program had at least 25 audio lessons I would’ve gladly given it 5 stars. I still highly recommend it. The amount of audio lessons you get for the price you pay isn’t bad. But it also isn’t exceptional. I have purchased and reviewed maybe 4 or 5 audio programs from this same author and this is probably my favorite. Why? 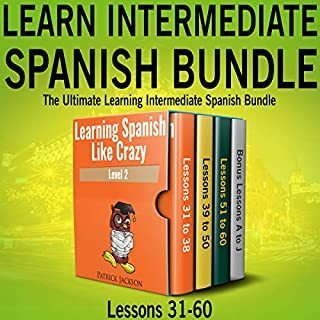 Because it does such a wonderful job of taking the most challenging areas of Spanish grammar and making them very easy for a native English speaker to understand. And without giving you the feeling that you are learning grammar in a classroom setting. In fact, when I am learning Spanish grammar with this program I feel more like I’m just learning conversational Spanish as opposed to learning the rules or structure of a language. If I were to win the lottery, I would do X or Y. If I were rich, I would do X or Y. They would have hired him. We would’ve invited more people to the party, etc. I also feel very comfortable using plural commands in Spanish now. So instead of only being able to tell just one person to be seated I can now tell several people to be seated. And instead of only being able to just one person to be quiet, I now know how to tell two or more people to be quiet. Another thing that really impresses me about this program is that there is so much content for your money. Besides the 30 audio lessons which make up the core part of the program there also 10 bonus lessons which teach intermediate or advanced topics of conversational Spanish. But I think what I like most about this program is the fact that it does such an awesome job of teaching the Spanish subjunctive. And the Spanish subjunctive is one area of Spanish grammar that has really frustrated me in the past. I’m still far from an expert when it comes to using the Spanish subjunctive but after using this program I do feel a lot more comfortable using the Spanish subjunctive. 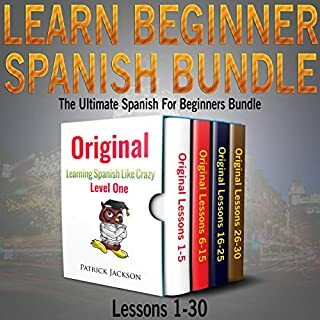 One major benefit of this program is that the creators of the program use the same engaging and interactive method in New Millennium Beginner Spanish that they use in their Learn Beginner Spanish Bundle. And I find that method to be one of the most effective for learning how to correctly pronounce all the different words and phrases in the Spanish language. And instead of learning Spanish centered around the same old conversations that most Spanish programs cover such as checking in a hotel or eating a restaurant, you learn Spanish for conversations centered around social media and other topics for this millennium. For example, in the first lesson, you learn Spanish that involves a conversation between two people talking about Facebook. And you learn the Spanish vocabulary for sending someone a Facebook request and adding someone as a Facebook friend. In lesson number two, you learn how to conjugate some Spanish verbs in the past tense. But you also learn Spanish vocabulary for writing on the facebook wall of someone or liking their Facebook pictures. In a later lesson, you hear a conversation that teaches you Spanish vocabulary for tagging someone in a Facebook picture and blocking and unblocking someone on Facebook. You even learn Spanish for conversations about eating as a vegan or vegetarian. And unlike older Spanish programs where the characters have professions such as doctors, lawyers, police officers and firemen, the characters in these conversations are personal trainers, graphic designers, digital nomads, yoga instructors and Uber drivers. The only thing I do not like about this program is that there are only 11 lessons. There are some bonus lessons but I have not listened to the bonus lessons yet. 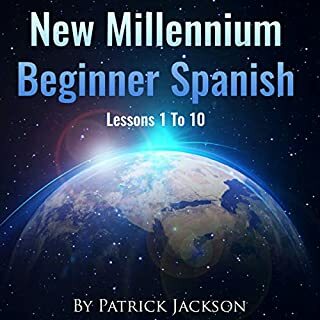 To really cover the topic of Beginner Spanish for the New Millennium, a Spanish program needs to consist of more than 11 lessons, which is why I am only giving this program 4 stars instead of 5. But despite the 4 star rating, considering your available options, this is probably your best and only choice to learn Spanish for this Millennium. This audiobook is among my top 5, if not my top 3. What I enjoyed most about all of these audio lessons is that the lessons taught me practical, conversational Spanish. And the teaching style really helped to improve my Spanish pronunciation. But one thing that really stands out about this program is that the interactive method really helped me to think in Spanish. One problem that I have always had is that when I hear Spanish spoken, I try to translate it in my head. Which doesn not work because by the time I finish translating a phrase in my head, the speaker is already finishing another phrase or two. But I noticed that the interactive method used in this program forces me to actually think in Spanish as opposed to mentally translate from Spanish into English. Another thing that I really like about this program is that they include several bonus gifts. One bonus gift that this program includes, allows you to attend a monthly online Webinar taught by a Spanish teacher from Colombia. There is no extra cost to pay in order to attend the monthly online Webinars. One thing that I should make clear is that that the target market for this audio program seems to be the Spanish-language learner who wants to eventually achieve fluency in Spanish, and not just someone who just wants to pick-up a few travel phrases that will come in handy for tourists. 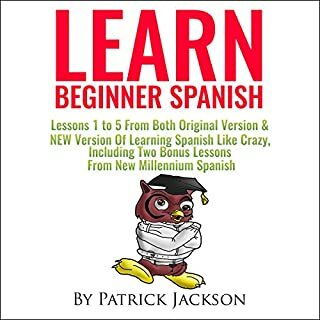 If you are running short on time and you need an ebook to quickly pick-up of some travel phrases for an upcoming trip to Cancun, Mexico or Barcelona, Spain and you have no intentions of making the effort to learn to speak Spanish fluently, there are definitely better choices than this program. But if you are absolutely sure that you want to begin the long journey it takes to learn to speak Spanish fluently, then I highly recommend this program. The first 5 lessons in this program are lessons 1 to 5 from Level 1 of the “original” Learning Spanish Like Crazy. The next 5 lessons in this program are lessons 1 to 5 from Level 1 of the so-called “New & Improved” Learning Spanish Like Crazy. And the two bonus lessons are lessons 1 and 2 from New Millennium Beginner Spanish. What I enjoyed most about all of these audio lessons is that the lessons taught me practical, conversational Spanish. And the program’s teaching style of listening and repeating really helps to improve Spanish pronunciation. But one thing that really stands out about this program is that the interactive method really helped me to think in Spanish. One problem that I have always had is that when I hear Spanish spoken, I try to translate it in my head. Which doesn’t work because by the time I finish translating a phrase in my head, the speaker is already finishing another phrase or two. But I noticed that the interactive method used in this program forces me to actually “think” in Spanish as opposed to mentally translating from Spanish into English. Another thing that I really like about this program is that they include several bonus gifts. One bonus gift that this program includes, allows you to attend a monthly online Webinar taught by a Spanish teacher from Colombia. There’s no extra cost to pay in order to attend the monthly online Webinars --which really surprised me. But my favorite bonus from this program is that they now include two extra audio lessons from their New Millennium Beginner Spanish program. To my knowledge, New Millennium Spanish is the only program that teaches not only basic Spanish vocabulary but also Spanish vocabulary for social media, the Web, modern technology - and a lot of other topics that older Spanish programs don’t cover. Such as, eating organic food, living abroad and working as a digital nomad, and working out at a cross-fit or MMA gym. I should also add that the target market for this audio program seems to be the Spanish-language learner who wants to eventually achieve fluency in Spanish, and not just someone who just wants to pick-up a few travel phrases that will come in handy for tourists. If you’re running short on time and you need an audio program to quickly pick-up of some travel phrases for an upcoming trip to a Spanish-speaking country and you have no intentions of making the effort to learn to speak Spanish fluently, there are definitely better choices than this program. But if you’re absolutely sure that you want to begin the long journey it takes to learn to speak Spanish fluently, then I highly recommend this program. Are you sick and tired of learning basic Spanish in the slow lane? Well now you can finally accelerate your learning Spanish and get in the fast lane of learning Spanish. 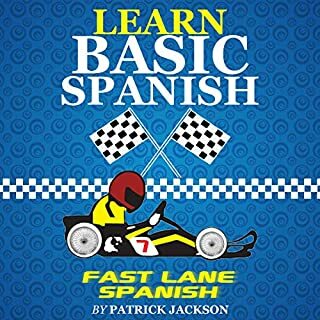 Unlike other Spanish programs which focus entirely on conjugating Spanish verbs, Fast Lane Basic Spanish focuses not only on conjugating verbs but also on teaching you Spanish pronouns and prepositions. The only way you can become truly fluent in Spanish is by mastering Spanish pronouns and prepositions. When it comes to basic Spanish, this program is probably my favorite. Mainly because this audio program does such a great job of teaching Spanish pronouns and prepositions. Before this program was created, if you really wanted to master Spanish pronouns and prepositions, you would have had to buy Dorothy Richmond's book, "Spanish Pronouns and Prepositions" from the "Practice Makes Perfect" series. If I’m given a choice between learning a Spanish grammar topic from a book versus an engaging audio program, which one I’m going to pick, is a no-brainer. Since the voice actors in this audio-program are all native Spanish speakers, the program does double- duty – by teaching me both Spanish vocabulary and grammar – while also teaching me proper Spanish pronunciation. And that’s going to be really helpful for me, especially if I’m vacationing in a Spanish-speaking country and I’m having trouble locating the tourist attractions. Not only will I need to know how to ask directions - but I’ll also need to actually understand the directions when their spoken to me in Spanish. Another thing that I really like about this program, besides the affordable price, is the teaching method. The same guys who made Learn Beginner Spanish also created this program. And they have used the same teaching method in this program. The only thing that would have made me happier would be to include the PDF instead of having me purchase it at Amazon even if the price is only 99 cents at Amazon.